The hosts at the Mestalla Stadium put on a show of mesmerising football but had themselves to blame for an unnecessarily narrow scoreline. 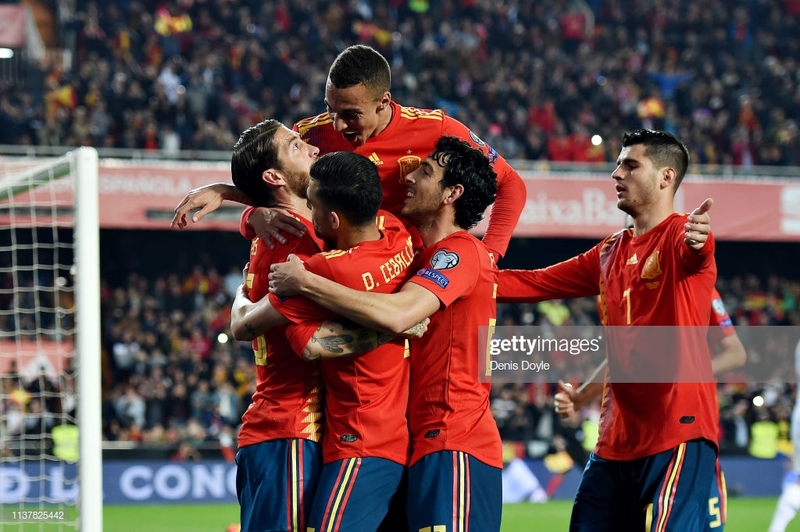 The Luis Enrique era continued in its positive direction as Spain began qualifying for the 2020 European Championships with a 2-1 victory over Norway. Clearly superior against a rigid, resilient outfit, La Roja took the lead 16 minutes in when Rodrigo slammed home a delightful cross from Jordi Alba, however they were left ruing a number of squandered opportunities when Joshua King equalised from the spot in the second-half. Minutes later, however, up stepped Real Madrid and national team captain Sergio Ramos to score a penalty of his own, meaning Spain kicked off their qualifying campaign in the best possible fashion. At the Mestalla Stadium, the tune of the wordless Spanish national anthem was recited with pride by the home crowd. The venue has stood as the home ground of Valencia for 96 years. It was the hosts who mustered the first chance of the game as neat football from Spain released Marco Asensio down the left. The Real Madrid attacker reached the byline before chipping the ball back for Álvaro Morata, but the striker could only produce a tame header at goal. The Atletico Madrid striker had another opportunity when he nicked the ball from former teammate Martin Ødegaard and slalomed into the area. Morata opted against shooting and attempted to cross for Rodrigo, but Havard Nordtveit cleared crucially. Spain continued to probe the opposition defence and found considerable joy through Jesus Navas on the right flank. The 33-year old collected the ball deep in the attacking third and hesitated before delivering a vicious cross into the centre, but Norway managed to scramble the ball clear. It would have been a fair assessment to say the breakthrough was on the cards, and it eventually arrived with a superb goal from the hosts. Alba played a one-two with Asensio to break free down the left wing. The Barcelona full-back's touch looked slightly heavy but he managed to hook his foot around the ball and his cross fell perfectly for Rodrigo, who volleyed home emphatically. The stadium was overjoyed to see a Valencia player score on home turf — chants of Rodrigo's name rang around the Mestalla. Just four minutes later, Spain continued applying pressure on the Norway goal. A lengthy passing move eventually fell to the feet of Navas who calmly caressed the ball to Rodrigo. The goalscorer attempted an audacious back-heel but Rune Jarstein would not be deceived and saved at his near post. From the resultant corner, the ball dropped kindly for Morata but his powerful header fell directly into the arms of the Hertha Berlin goalkeeper. Spain came close to surrendering their own lead in the 25th minute as a result of some risky football: another local player, Dani Parejo, played an awkward pass back for David De Gea but the Manchester United stopper was able to fork the ball clear before Tarik Elyounoussi could pounce. Down at the other end, Rodrigo gained possession in the centre of the pitch before driving at goal and wriggling away from three Norwegian defenders. The 28-year old reached the edge of the area but opted against shooting — Morata was not anticipating the through-ball which trickled into Jarstein's gloves. Norway then mustered their first chance of real significance. Hull City midfielder Markus Henriksen found space on the right side of the Spanish box and lashed across goal for Elyounoussi, but the ball rebounded off his heel and De Gea gratefully claimed before Henriksen could meet the rebound. Quick-fire chances to double their lead were then wasted by the hosts. Parejo took a free-kick from a wide position and whipped the ball into the centre of the box where Morata was lurking, but the striker was left ruing yet another missed opportunity as Jarstein scrambled across spectacularly to save at his far post. Morata had another opportunity from the following corner after a cushioned header from Iñigo Martínez, but it sailed over the bar. Eight minutes before the break, Spain produced a sensational spell of football which deserved a goal. Asensio received the ball on the edge of the area before picking his head up and threading it through for Parejo. The 29-year old back-heeled for Morata, who in turn feinted the ball, leaving a treat for Rodrigo to latch onto — but Nordtveit cleared with a vital interception. Another superb move from the hosts did eventually find its way into the net when Dani Ceballos fed a deep-lying Morata in midfield. He played a one-touch pass to Asensio in acres of space on the left flank and the 23-year old crossed for the bombarding run of Alba who poked home — but the flag was raised for offside. The final chance of the period fell for Ceballos who danced effortlessly through the Norway defence and forced a fine save from Jarstein. The first-half certainly would have made for much grimmer viewing for the visitors had their reliable goalkeeper not been at hand. After the restart, Spain resumed in their flamboyant, effervescent fashion. Morata wriggled his way into the box but Nordtveit managed to block the sting out of the shot with a crucial challenge. Just before the hour mark, Ceballos crossed for his Real Madrid teammate Ramos, but the centre-back somehow prodded wide from little more than two yards out. La Roja appeared to have everything except a clinical finish. As per the cliché, Spain lived to regret their plentiful squandered chances when Norway were awarded a penalty. Martínez wrapped his arms around Bjørn Johnsen at a corner situation, and AFC Bournemouth striker King stepped up to slam past De Gea. Naturally, Spain immediately pushed to retake their lead. Ceballos collected the ball on the wide edge of the area and chipped the ball in for Morata, who saw yet another headed chance go begging. With 20 minutes of regulation time remaining, the hosts were awarded a penalty of their own. Morata, seemingly involved at all instances on the night, pounced on a loose ball behind the Norway defence and was met by the oncoming Jarstein who claimed none of the ball and all of the man. Captain Ramos took the kick and restored his side's advantage with an impudent panenka into the roof of the net; the first time in his career scoring in five successive international matches. That's some feat for a defender. The game petered out from that point onwards to make for a second-half which was far less eventful than its predecessor. Norway's final chance of the game came in the 88th-minute when King was sent down the left on what looked to be a devastating counter-attacked, but the goalscorer could only knock the ball behind for a goal kick. While some may argue La Roja have fallen some way behind the heights they achieved between 2008 and 2012 when they dominated the world and European stages, this performance would suggest they are still a mightily talented footballing side. Asensio and Rodrigo were at times unpreventable on either wing, flanked by the attacking impetus of Alba and Navas, while a midfield trio of Parejo, Busquets and Ceballos surveyed the centre of the pitch and supplied numerous chances for the striker, Morata, in a vibrant display of elegant football. However, for all that Spain were intricate, they were certainly wasteful too. Morata was the perfect personification of this notion — each and every aspect of his game was carried out to a tee until it came down to that elusive final touch — while others behind him were equally guilty. This was a real chance to summon up a statement victory after the disappointment of the 2018 World Cup, but it's a vital victory nonetheless for Spain and Enrique. It was a peculiar squad named by Enrique for this round of fixtures. Since Gerard Piqué, Andrés Iniesta and David Silva all bowed down from international duty, the former Barcelona manager has used no less than 32 players in a bid to rekindle the magic they provided. A fairytale reached another chapter as Getafe striker Jaime Mata was introduced from the bench — the 30-year old was competing in the third tier of the Spanish pyramid just five years ago. Real Betis midfielder Sergio Canales also made his debut. Meanwhile, the likes of Martínez, Navas, Ceballos and Parejo all added to their so far sporadic tally of caps and looked comfortable in the set up. Enrique looks to have discovered a way of coping without the ever-increasing crop of players bowing down from the international stage. Spain visit Malta on Tuesday night, while Norway host Sweden at the Ullevaal Stadion.